This week, we asked Log Home Industry leader and editor of the Log Cabin Directory, Tom Heatherington, what his thoughts were about traditional timber framing as it compared to log homes. Read below as he shares his opinion. What are the main differences you see between log and timber frame homes? It is amazing to me how many people begin their quest for a log home and end up choosing to build a timber frame home. That may not be surprising when you consider that the average buyer isn’t knowledgeable about the nuances of log or timber frame construction, they just know they want the look of wood. In my case, I love the look of stacked logs, but as a hobbyist furniture builder, I really appreciate the joinery that goes into a timber frame structure. To me there is something magical about exposed large beams that are cut and fitted together like fine furniture. 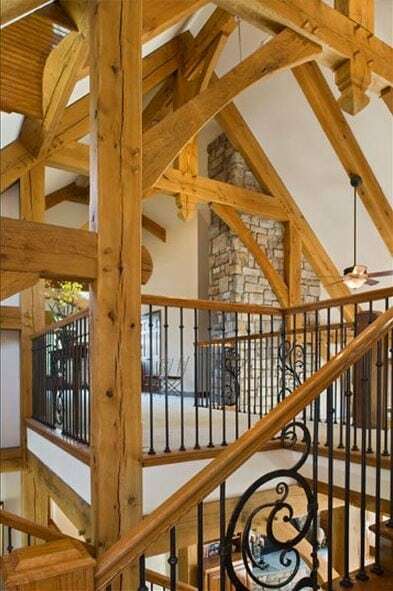 What do you like about timber frame homes that log homes do not typically share? With a log home in general, there’s a whole lot of wood that can sometimes be overwhelming. Four walls, a ceiling and floor made from wood can present some decorating challenges, and if the home isn’t lighted appropriately all that wood can be overpowering. A timber frame design does not have such issues. The openness of a timber frame floor plan means more flexibility and decorating options. How have you seen Timber Frame home designs change in the last few years? Housing in general has seen a reduction in the overall size of homes being built over the past few years and this trend holds true for timber frames. Timber frame popularity has been on the rise and with that I’ve been noticing more creative designs and more timber frame hybrids being built. A hybrid often means that the great room and kitchen feature timber framing while the rest of the house utilizes traditional framing or SIPs. We would like to thank Tom for taking the time to provide his unique view on timber frame homes. To learn more about Tom and the Log Cabin Directory, visit: http://www.logcabindirectory.com.